cf357's review (This content has been automatically translated from French)" The indispensable tool"
Besides price beating all competition, I chose the EIA-Pro AKAI for its relatively large number of inputs (4 + 4 instrumentals inserts) and its integrated USB2 hub. It's silly to say, but for me that connects a lot in USB (master, nano-kontrol ... Keyboards) on a Macbook with only 2 ports, this is a strong argument that ending up with 4 Additional ports. Nothing special to report, everything seemed clear. I have a slight defect on one of my knobs: the dress in plastic tends to go if you pull on them, but nothing extreme. I love the ability to mix monitor output and single output. Little thing that bothers me (I have not tried): It is no longer possible to control the overall volume on the Macbook, that goes over the USB is a level 100%. No worries for me. I'm easily under 10ms latency 96 KHz, I have not tried to go lower. I was seduced by its design, and when I saw the price and features, I literally cracked. This is a great tool, very quality without breaking the bank. To end on a detail that crosses my mind, it's a shame not to be able to remove the light on the meters; these are really sharp when working a bit in the dark. 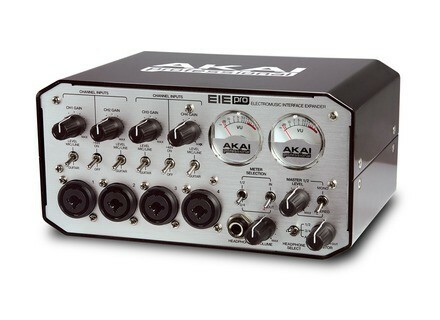 Who needed a usb hub and a sound card in my living room or + mobile mixer that I became pro EIA and am super satisfied! Macbook connected to my "white" 4GB Ram it turns nickel. I use it mostly in IN for recording, the sound coming in my OUT OR A10. Or nomadic ..
Update drivers required to run on Maverick. The map is provided at the base with an ID key lock licenses to carry your PC pc and Protools that you suddenly eat a USB. Once parametrized in Ableton everything revolves nickel. Parameters depend on the intended use ... acoustic j decrease the size of the buffer to 256 or 128 history to have no latency for recording vocals separately and have an imperceptible latency. Electronic j'm 512 with either Live mode average 8/10 tracks composed by fashion .. 8/10 tracks with an average of 2/3 effects per track and 2/3 effects on the master and everything revolves nickel. I've tested with a buffer 1024 in live mode and at first glance it seems not change the masses ... I still dig the map for a month. I AKAI since 2 months max. I have the A10 which allows me to mix 4 decks but has no instrument input. I also have a mixer Berhinger which is much less portable and whose preamps are all m ^ m a notch below the pre-amp AKAI. A very good product Q / P I would buy again and I would recommend anyone looking for a versatile sound card especially for mobile phones with limited connectivity. Chlamydiae's review (This content has been automatically translated from French)" Effective with a great look"
Used with said table, and a PC Asus i5 2400 with 8 GB of RAM and Windows 7 home premium 64 bit. The driver is perfectly stable, no update since installation. Used with Cubase Elements 7 64-bit as DAW and VST Hosts for fast driving synths. The installation is done without problems, I / O Midi over USB are a real plus, as well as the integrated USB hub. The manual is a little short, and there are no options for the AKAI software, everything is done by lez host. Reesmo0's review (This content has been automatically translated from French)" Very good audio interface"
I was looking for a USB audio interface, with inputs and outputs "lines", as well as instruments, with A / D 24bit, 96kHz converter, for use with laptop or Pc Pc tower (portability), Windows 7 and 8. Stable drivers, use with Cubase, Live! (8ms latency). I recorded one track at a time but I think it can record 4 tracks mono silmultané. The instrument preamp (guitar inputs) is of good quality and very good results for the price of the interface. We began to feel his weaknesses when multiple virtual instruments are used (3 or 4 max, if some effect plugins used), pure audio tracks, one is less limited (depending, always, the number of plugins used ). citron69's review (This content has been automatically translated from French)" Clean and tidy"
Four inputs, four outputs. It does not replace a mixer but for me, it saves a mix plus two inputs (with the possibility to choose the type analog input: line / mic (with or without phantom power) / guitar. ASIO drivers stable, low latency. Installation (PC win7) is very simple. No such problems with the EIA! I think Akai has paid particular attention the analog part of their interface. tilous's review (This content has been automatically translated from French)" Comprehensive"
Anonymous 's review (This content has been automatically translated from French)" Not disappointed ..."
Purchased, at first, to be able to properly register and begin Music without it costing me an arm (limited budget). Assuring me, also, honorable and satisfactory quality to my ears. In a second step: the ability to insert four instruments / mics and record at the same time. Option that made me buy the Roland UA55 concurence Quad capture .. In a third step: the possibility, later adding other devices through ports noon, HUB and insert entries. In use, the original supplied drivers are stable and I do not need to perform updates while the latter is available on the Akai. Anyway ... Whether one or the other, no worries for the recording and playback of four tracks simultaneously heard ... No latency for me. I use it for three months and it satisfies the inexperienced I am. I will publish my opinion in the year to bring back more "supported". pithondeplume's review (This content has been automatically translated from French)" BEAUTIFUL INTERFACE"
I do not know why, but from time to time a blue screen appears and I have to reboot the system. 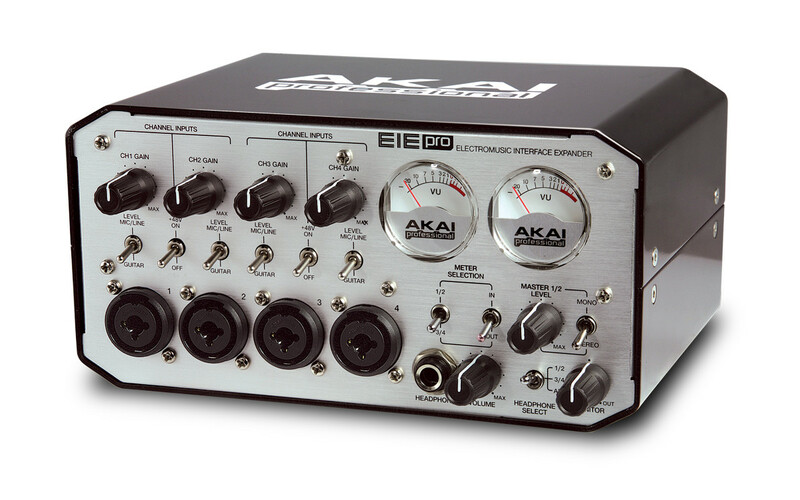 I use this interface EIA Akai Pro for several months and really if the choice again I was back in the merchant eyes closed. fidwood's review (This content has been automatically translated from French)" Interface very convincing"
The most for me was the 4 inputs. And I confess I do not remained indifferent to her look ... And relying on the reputation of Akai. Installation could not be more simple. One branch is used. For 3 months, it makes me great service, with no apparent problems. Little less perhaps, the space between the knobs quite limited ... but good. windigo's review (This content has been automatically translated from French)" Very simple and positive." Needing to copy a configuration starting from a console and through a Fast Track Ultra, the budget is tighter, I tested the Akai EIA at its output, but it was USB 1.1 and 16 bits. Then the Pro's output in the wake, phew, USB 2.0 and 24 bits, sample rates from 44.1 kHz, 48 kHz, 88.2 kHz to 96 kHz. The use should be simple, because everything started from a console (Peavey), but the recording had to go through a PC, a goal achieved through this interface 4 x 4 Look at the beautiful and easy to use, recognized several configurations and all software tested. Selective listening headphones on the front. 4 outputs on the back Jack 6.35, a power supply (included) and cherry: a three-port USB Hub very useful, MIDI In & Out, and a switch .. The drivers very stable, no need to update. Pro Tools, in loops, Mixcraft, Maker Premium MX, etc..
Two inputs used, four outputs, for a start of 10 tracks, so no latency observed, it's all good. Simpler, hard to beat, recognized by many systems, just plug. None known to date. No need for a manual 4 x 4 with four potentiometers on the four inputs, two portholes vintage VU meters and accurate. Since its initial availability, if you count the 1.1, except for the final configuration in "Pro" for a month. Yes, too many interfaces, Lol. But what good is a model that I think will make people happy, the Fast Track Ultra, a little more comprehensive but more expensive does not even arise as a rival. Good quality, price, Look, the results obtained, its simplicity, deserves to be known, see in the future for reliability, but all builds confidence. Akai, with both EIA, especially the Pro will appeal to a wide audience, a choice recommended to make or remake without problem.